I am so thankful that this place is closed most of the time I'm on my way home, otherwise I'd be "in the neighborhood" all the time. I finally got to stop by this weekend to try their pies. The space is tiny, but has that vintage, nostalgic feel to it. It's adorable! 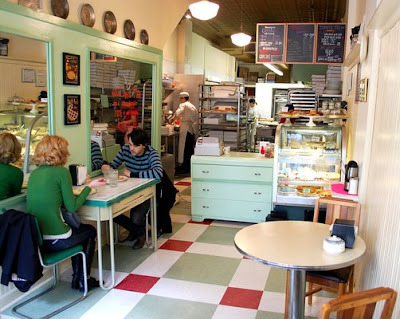 My roommate told me that the owner moved into this space primarily for the kitchen space in order to bake pies for mail order, but it became so successful and popular that they now have walk in guests. They have only 3 tables inside, and most of the space is devoted to their kitchen, but I hear that they are expanding next door to accommodate all the foot traffic. Paula Haney was a pasty chef at Trio but decided to go out on her own and started make fresh pies. She started selling them at restaurants and farmers' markets and finally opened Hoosier Mama Pie Company in the Ukrainian Village. They have a wide range of seasonal pies that they rotate on a daily basis. We were there late Saturday afternoon and most of the items on their chalkboard was sold out. Lucky for me, they still had a slice of their signature Hoosier Sugar Cream Pie. According to Wikipedia, the Indiana version of a sugar pie, known as a sugar cream pie, was introduced by Quakers settlers from North Carolina in the early nineteenth century. Sugar cream pie is made from flour, butter, salt, vanilla, and cream, with brown sugar or maple syrup. It sounds so simple, but it is so good. 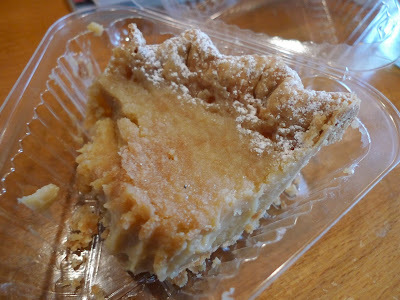 I am not the biggest pie fan; I am of the rare breed that eats all the filling and bypasses the crust, but I will have you know that I ate pie crust and all of my Hoosier Sugar Cream Pie. The texture of the filling is smooth and creamy like sweet potato or pumpkin pie but it tastes like a maple cream candy. I can see why this is an Indiana farm classic. Sorry guys, I should have been civilized and put this on a plate to eat and taken a nice pictures for you, but I couldn't resist. On Fridays, they have Friday Night Flights, where they offer a pie flight of three small slices of pie and a cup of coffee for $8. It sounds like the perfect way to sample their collection of pies. you should come to pennsylvania and try one of our "whoopie pies"
ooh that sounds like a great idea! Do you like them?